Catholic Action have been regulars on Popped in recent times, so naturally their debut album, In Memory Of, was one we’ve been eagerly anticipating for a while. Since the release of their first single, L.U.V., the band’s following has steadily increased thanks to a stream of infectious singles and a number of prestigious festival slots included SXSW and Radio 1’s Big Weekend; closer to home, the band headlined the legendary King Tut’s venue as part of Tenement Trail, a mark of their popularity even before the release of In Memory Of. The aforementioned L.U.V. 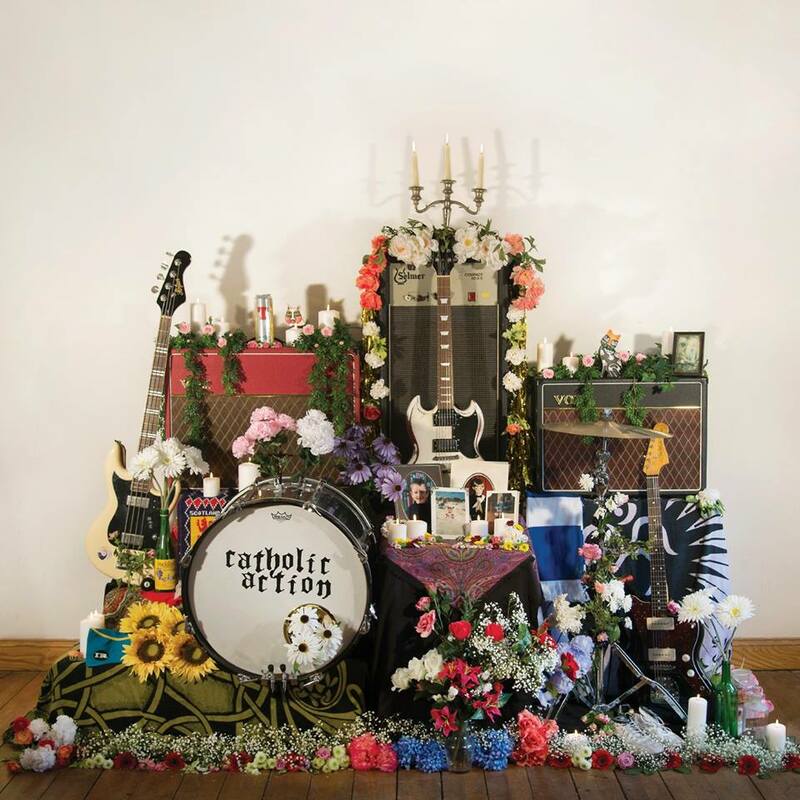 opens the album in spectacular fashion, its bouncy intro heralding a song which combines art-rock riffs and pop sensibilities to produce a sound which is both distinctly Catholic Action and distinctly Glaswegian. It’s a high standard to set, but for the next 4 or 5 songs there’s no let-up with the following track, Propaganda, being one of the album’s stand-out moments. Featuring prominent synths and a Cure-esque vocal from Chris McCrory, there’s a more 80’s-style vibe going on than usual as the band take a swipe at the club night of the same name (lyrics include “music to tick boxes/I will never be like you”), delivered in blistering fashion. An advert for the night, it most certainly is not. Another highlight is Black & White, a simply massive track which was also a recent single. Making its intentions clear from the powerful opening chords, the song is built around melancholic verses (“Black and white, but mostly black”, intones McCrory) which give way to soaring choruses, lending proceedings a more optimistic outlook; the juxtaposition in the title seems to fit the mood and flow of the song. Up next is Breakfast which is perhaps the pivot of the album, marking a change in sound and approach. First released last year as a double A-side with Rita Ora (which sadly didn’t make the album), it’s a much broodier affair than the preceding tracks, managing the trick of sounding ever-so-slightly languid and yet intense via the crashing guitars. It signals a shift in the album’s tone, giving way the equally dark The Shallows, a ponderous, introspective affair which is, sadly, one of the last moments of note on the album. New Year, for example, is a return to the more up-beat nature of the earlier tracks on the album, but is not, frankly, very good at all. The musical melody is decent enough, and the vocal line and lyrics about Christmas Eve would perhaps suffice if it had been released as a seasonal track with a few sleigh-bells on top, but as part of an album, it feels like a pastiche that should have been left on the cutting room floor. Elsewhere, the likes of Childhood Home and the closing Stars & Stripes are slower, ponderous affairs which don’t really seem to have any particular direction and pass by without really grabbing your attention at any point. The band have stated a desire to “connect…with tracks deeper in albums, the one that probably won’t be talked about in the press”, and it does sound like they’ve made a conscious effort in that direction: in contrast to the breezy, assured nature of many of their tracks, In Memory Of begins to feel rather laboured towards the end. That said, the latter stages of the album contain what is maybe its crowning glory in the shape of the brilliant Doing Well. Infectious and uplifting from the very first chords, there’s everything you might want from a pop classic including a great guitar riff, hand-claps and a chorus which is guaranteed to lodge itself in your head for a long time. We’ve previously described it as one of the best singles of the year and see no reason to change our minds about that. For all that In Memory Of loses its way at points, it remains a very accomplished album over the piece. From the sparkling, polished pop of Propaganda and Doing Well to the power of Black & White, the high points outshine the lesser moments and there’s more than enough on offer to keep you going back for more.